Diplomatic representation from the US: chief of mission: Ambassador Wyche FOWLER, Jr.
Economy - overview: This is an oil-based economy with strong government controls over major economic activities. Saudi Arabia has the largest reserves of petroleum in the world (26% of the proved reserves), ranks as the largest exporter of petroleum, and plays a leading role in OPEC. The petroleum sector accounts for roughly 75% of budget revenues, 40% of GDP, and 90% of export earnings. About 35% of GDP comes from the private sector. Roughly 5 million foreign workers play an important role in the Saudi economy, for example, in the oil and service sectors. Saudi Arabia was a key player in the successful efforts of OPEC and other oil producing countries to raise the price of oil in 1999-2000 to its highest level since the Gulf war by reducing production. 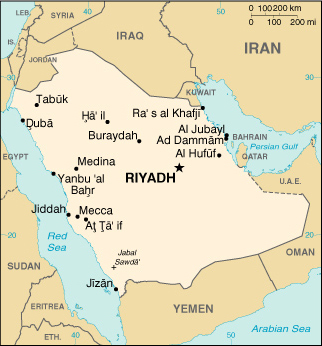 Riyadh expects to have a moderate budget deficit in 2001, in part because of increased spending for education and other social programs. The government in 1999 announced plans to begin privatizing the electricity companies, which follows the ongoing privatization of the telecommunications company. The government is expected to continue calling for private sector growth to lessen the kingdom's dependence on oil and increase employment opportunities for the swelling Saudi population. Shortages of water and rapid population growth will constrain government efforts to increase self-sufficiency in agricultural products.